IndieCade East returned for a second edition at the Museum of the Moving Image in Queens, bringing together professionals and enthusiasts in the burgeoning realm of independent gaming. One of the highlights of the February 14–16 conference, an East Coast iteration of the West Coast-originated International Festival of Independent Games, was the presentation by game creators of their work. Here are four of these “Show & Tell” games that displayed some innovative ideas sparking from experimentation with what game play can be. The premise of Moon Rabbit (pictured at the top of this post) — is pretty simple: “The moon rabbit and his infinite number of friends are very hungry. 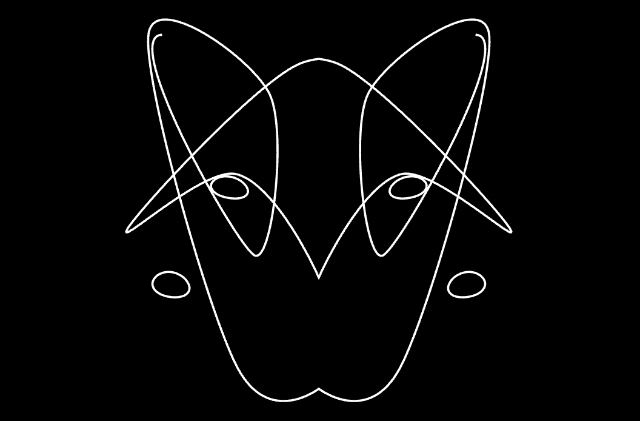 Use the mouse!” But moon rabbit and his friends are abstract renderings of lines, endlessly and randomly generated. As the game states, “There is no ending. You win!” Yet what makes the game interesting is how you start to make faces from the squiggles and circles, figuring out what could be a mouth and offering it a pixelated morsel which it happily eats while squinting its “eyes.” Moon Rabbit was created at the 2014 Global Game Jam by Mario von Rickenbach and Aaron Keeth, and is an oddly mesmerizing meditation on how our brains form the familiar out of the strange. 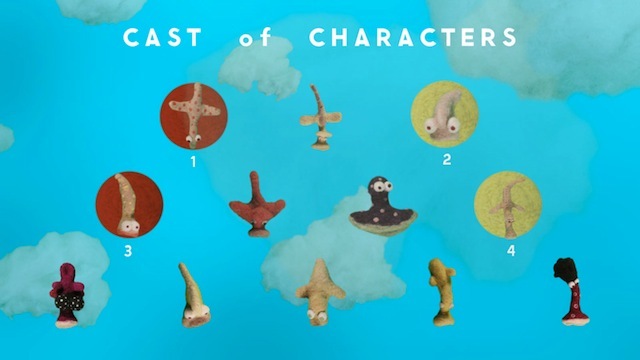 If you missed it at IndieCade, it’s available to download for free online. The delightful Nest by Ken Amarit plays like a lot of games; you guide a creature to take hold of different sky nests and fight against your opponents, a sort of sky-based “king of the hill.” However, it’s completely stop-motion, with all the characters made by Amarit from felted wool. He’s worked in this mix of media before, including Voyager where you zoom through a felted space and encounter fabric asteroids and aliens, and Nest is an engaging continuation of this clever use of a non-digital medium for video game play. Even better, you can play Nest in its own felted wool arcade cabinet at Death by Audio in Brooklyn through April. You get many lives in many games, but rarely do those failures come back to haunt you. 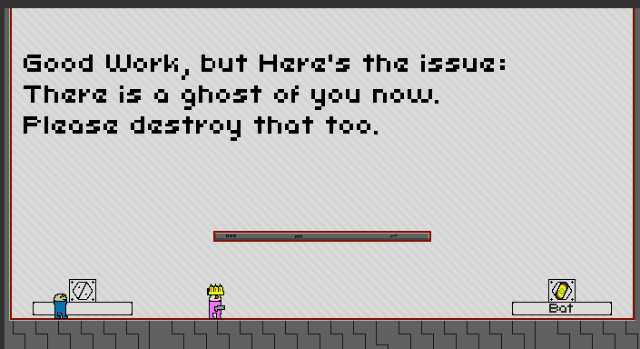 In Extreme Exorcism by Michael Christatos and Andy Wallace, every time your little blue character dies, you return as a ghost that does exactly what you previously played with the same powers. Soon you’re totally swarmed by all these phantoms retracing your steps, and it’s surprising how hard it is not to make the same mistakes. You can try out the purgatory-like gameplay for free online at Kongregate. Finally, for a totally different style of gameplay, there was Voxiebox. The holographic arcade game system presents everything in a shaky 3D, the kind of technology you might imagine for an alternate reality version of the 1980s. The graphics are a little hard to focus on with their constant movement, but it really is an impressive experiment in giving DIY dimensions to two-dimensional gaming. IndieCade East was February 14 to 16 at the Museum of the Moving Image (36-01 35th Avenue, Astoria, Queens). Indie Essentials: 25 Must-Play Video Games continues at the Museum of the Moving Image until March 2.